Welcome to the website of Obee's in the Charlotte Harbor area of Port Charlotte, FL. We are located in the Schoolhouse Square just off Harborview Rd and Kings Highway. Here you can view our menu, and place your order by phone or fax. Dine in and take advantage of our FREE WiFi. As always our soups, salads and subs are made fresh daily. Try one of our mouthwatering 8" or 16" subs. All subs can be made into a salad or a wrap. (We offer wheat, sun-dried tomato and spinach wraps.) If your looking for something to warm your insides, try one of our Broccoli Cheese, Creamy Potato, Italian Wedding or Chicken Noodle soups. If that's not enough, we have decadent brownies and cookies to satisfy your sweet tooth. Party trays and catering are available. Call Obee's of Charlotte Harbor to cater your party or event. 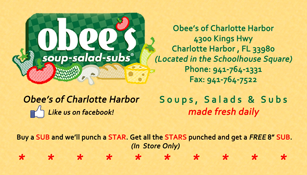 On your next visit to Obee's of Charlotte Harbor, pick up your Obee's punch card to earn a FREE 8' sub. Everytime you buy a sub we'll punch a star on your card. Get all stars punched and we'll give you a FREE 8" sub. Business Persons Special! We appreciate your business and to show you that we do, we'd like to give you the opportunity to have lunch on us. Simply drop your buisness card in our business card jar to be entered in our weekly drawing. You could WIN a FREE 8" sub on Obee's.